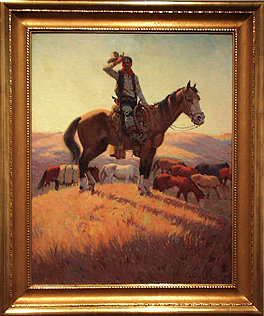 Bill Gollings is one of Wyoming's most celebrated cowboy artists. Born in Fort Pierce, Idaho, he spent his childhood in Michigan with his grandmother and completed his eighth grade education in Chicago. In 1896, his longing to be in the West brought him to South Dakota and eventually to his brother DeWitt's ranch in Montana. He borrowed a horse and worked the "grub trail" for the next 5 years. He worked odd jobs that paid for his room and boardbranding cattle, driving a stagecoach, trapping for fur, and hunting for gold. Living the life of a cowboy on the open range would become the source of his artistic work. As a young man, Gollings was fascinated by the drawings of Frederic Remington that he saw in Harpers Weekly. His admiration for Remington remained throughout his life. His older brother, Oliver, who could draw a horse from memory, was also an influence and it was with his encouragement that Gollings started drawing. In the early spring 1903 I sent to Montgomery Ward & Company for some oil colors and other equipment to paint with. When the snow went off I made a few crude attempts at picture-making. The people on the ranch where I stayed and called home thought them wonderful. That summer I covered the mess tent with charcoal studies; horse heads and certain characters who interested and asked my brother to bring me over. DeWitt would continue to encourage Gollings in his artistic pursuits, showing his work to furniture storeowner, Mr. Freeman, in Sheridan who later included Golling's paintings in his window displays. DeWitt sent some drawings to the editor of the Chicago Fine Art Journal, Mrs. Marion White. Recognizing that Gollings' work showed great promise, she encouraged him to study, encouragement that would eventually result in a scholarship at the Chicago Academy of Fine Arts. Gollings would work roundup in the spring and summer and find his way back to school and painting in the winter. In 1909, he established his studio in Sheridan, Wyoming. I built a shack and called it a studio. The skylight in the roof gave me the right to cal it such.) I had met and talked with a few of America's foremost painters: H. H. Sharp, Howard Russell Butler, William B. Henderson, C. M. Russell, Frederic Remington (now dead) and a few lesser lights. They have all had a good influence on my work. My work has had a good distribution throughout the United States and even in foreign countries. Four of my pictures are in the Wyoming capital at Cheyenne: "The Smoke Signal.Indian Attack on the Overland Stage.Emigrants on the Platte," "The Wagon Box Fight." I have no pictures in permanent galleries. I do not consider the others worth mentioning. Work for the rest of my life is ahead of me with only one thing that would ever take me from it: to be younger and have the country open and unsettled as it was when I first made riding my profession. The Sherry Nicholas Collection at the UW Art Museum, originally assembled by Dr. William T. Ward, includes 71 paintings, drawings, and sketches. A monograph on the works of Bill Gollings is scheduled to be published in 2007 by Ward and Gary Temple. Left: Looking for the Wagon, 1930, oil on canvas, 30 x 24 inches, Sherry Nicholas Collection, GOL 37. 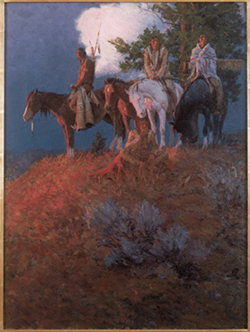 Right: Indian Sunset, 1926, Oil on canvas, 23-1/2 x 17-3/4 inches, University of Wyoming Art Museum, Sherry Nicholas Collection, no. 26.